MOSCOW -- Former NSA systems analyst Edward Snowden, who is wanted by the U.S. for leaking details about once-secret surveillance programs, has been granted permission to stay in Russia for three more years, his lawyer said Thursday. Snowden last year was granted temporary asylum of one year in Russia, but that expired on Aug. 1. His lawyer, Analtoly Kucherena, was quoted by Russian news agencies as saying Snowden now has been granted residency for three more years, but that he had not been granted political asylum. That status, which would allow him to stay in Russia permanently, must be decided by a separate procedure, Kucherena said, without specifying if Snowden is seeking it. He faces espionage charges in the U.S. that carry a sentence of up to 30 years, but Russia has no extradition treaty with Washington. Snowden was stranded in a Moscow airport last year en route from Hong Kong to Cuba, shortly after he released extensive documentation about National Security Agency's surveillance programs. He reportedly spent a month in the airport before receiving the temporary asylum, but was seen only at one tightly restricted meeting with human rights representatives. Since receiving the temporary asylum, his whereabouts have not been made public. The case has been a significant contributor to the tensions between Russia and the U.S.
"I don't think there's ever been any question that I'd like to go home," Snowden said in a television interview in May. "Now, whether amnesty or clemency ever becomes a possibility is not for me to say. That's a debate for the public and the government to decide. But, if I could go anywhere in the world, that place would be home." Kucherena said Snowden is working in the information-technology field and that holding a job was a key consideration in extending his residency. The lawyer didn't give details of where Snowden is working. 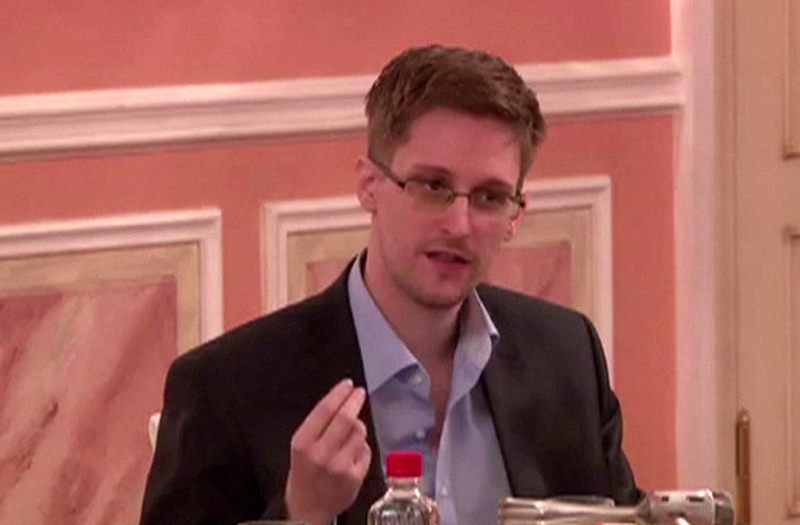 He also said Snowden is under the protection of a private guard service. Kucherena also was quoted by the Interfax news agency as saying that he intends to publish a novel that includes elements of the Snowden case. He claimed rights to the book have been sold to American film director Oliver Stone. Michael Hayden, the former director of both the CIA and National Security Agency (NSA) told "Face The Nation" in June that Snowden caused "unquestionable irreparable, irreversible harm" to the U.S. with the information he revealed. He said some revelations, such as the NSA's practice of collecting metadata on Americans' phone calls, revealed programs that do "impinge upon American privacy" and merit a debate. But other information that Snowden's documents revealed, like the extent of the U.S. ability to spy on foreign nations, was damaging, he said. "If he lives up to half of that resume he claimed to have, that he was actually a spy and an intelligence officer, he would understand that there is no way the United States can reveal, without creating far greater harm, what it is we have lost," Hayden said. "What is it that he wants us to do? To go out publicly with a list of all the terrorist targets now that we're no longer covering because of the information that he's revealed?"